Taste test: The debate about whether Pop-Tarts qualify as a snack is over, especially since Kellogg's has come out with Pop-Tart flavors such as Hot Fudge Sundae, Chocolate Chip Cookie Dough, Cookies 'n' Creme and Strawberry Milkshake (we'll try to get to all of those flavors eventually). 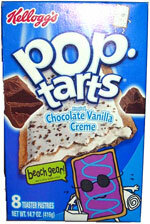 One of the original flavors that led Pop-Tarts down the path from somewhat nutritious breakfast complement (part of a complete breakfast) into sugar-laden anytime snack was Chocolate Vanilla Creme. This version is basically a chocolate Pop-Tart with a vanilla creme (not cream) filling. In this case, eating the tart cooked or uncooked is just as good, depending on whether you want melted filling or not. Trying to find this flavor is sometimes difficult, it's not as popular as the frosted strawberry, frosted chocolate or (ugh) S'mores flavors. If you find them, buy them, because we want Kellogg's to keep making this flavor. At first we thought that they had replaced this flavor with the Cookies 'n' Creme variety, but this is definitely a different flavor, and the much superior one. Smell test: Smells like a chocolate Pop-Tart. 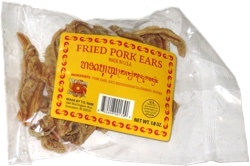 This snack was discovered by Keith at Shaw's in Worcester, Massachusetts. Review published .